After sorting out the black bamboo, Phyllostachys nigra, we had to cut down in order to fix part of the fence that was knocked down in last weeks high winds, I've ended up with another lovely bunch of black canes. 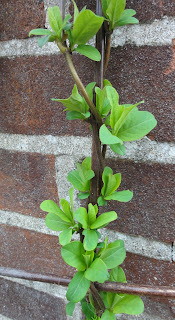 I've been musing over what to make from them, some pea and bean climbing frames, or another trellis. 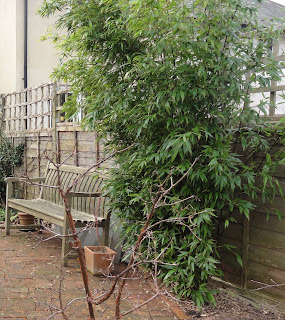 I made my first bamboo trellis last September, and am now growing an evergreen honeysuckle Lonicera japonica 'Hall's Prolific' up the canes. The honeysuckle has taken off amazingly well, and even though it is mid-winter, it has masses of bright green new growth. The black canes are not as black and shiny any more, but where the honeysuckle grows, you cannot even see the canes, so I can see eventually it will be a lovely green wall rather than the colder faded red brick and grey wall currently on view directly out of one of the kitchen windows. The bamboo wasn't planted in the best place, squeezed in between brick paving and right next to the neighbours fence. So it's rather taking over, growing under the fence, pushing against it, which I think was part of the reason for the fence becoming weak. However, it's a beautiful plant. I love the way it moves, the sound of the leaves, the fact it is evergreen, and is always elegant. I'm not that keen to take it out, so I'm making the most of this enthusiastic bamboo, gaining a yield at the same time as hopefully stopping it from taking over. And now I have some more canes to play with. I have my black Bamboo (and a yellow one) in large pots. Safer, but they do need lots of water and dividing them last year required a saw and strong arms. I would love to have room to grow them in the ground because they are beautiful plants and as you say their rustling sound is so attractive.